The ZoneFlex T300 Series, are dual-band 802.11ac outdoor access points (AP) designed explicitly for high density public venues such as airports, conventions centers, plazas & malls, and other dense urban environments.Offered as either with an internal omni directional antennas or with optional external 5GHz antenna support, the T300 Series is designed for easy installation within an ultra-lightweight and low profile enclosure. The T300 is ideal for venue owners and enterprises looking to quickly and economically deploy Wi-Fi in high-capacity environments. Omni-directional for very high-density deployments in arenas, stadiums, airports, etc. or external antennas. BeamFlex+ support for up to 4 dB of signal gain and 10 dB of interference mitigation in addition to the antenna gain. POE (Power over Ethernet). For deployment of multiple access points, a controller (sold separately) is highly recommended. Controller-specific features (such as Smart Mesh networking) are unavailable when the AP is running a standalone AP base image. Two-stream MU-MIMO 2x2:2 for simultaneous downlink transmissions to multiple Wave 2 client devices. Concurrent dual-band (5GHz/2.4GHz) support, 867 Mbps (5 GHz) and 300 Mbps (2.4 GHz) of user data rate. Up to 4dB of signal-to-interference and noise (SINR) improvement and up to 10dB of interference mitigation. Novel channel selection approach delivering up to 50 percent capacity gain over alternative background scanning. 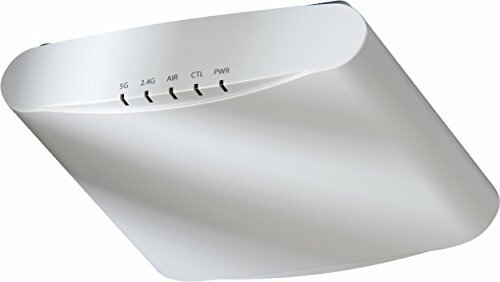 Supports up to 512 clients, 802.11ac Wave 2, POE (Power Over Ethernet) (No POE or power adapter included) For deployment of multiple access points, a controller (sold separately) is highly recommended. Controller-specific features (such as Smart Mesh networking) are unavailable when the AP is running a standalone AP base image. If you have any questions about this product by Ruckus, contact us by completing and submitting the form below. If you are looking for a specif part number, please include it with your message.